An adapted excerpt from Wake Up! : A Handbook to Living in the Here and Now. When we are tired, overstretched, depleted and just plain pooped we don’t have the energy to balance out our thinking. The conscious brain needs lots of juice and without it the subconscious just takes over. For us to wake up we need a good clean energy system. The whole book is about energy; but the distinction here is less to do with universal energy and more to do with our personal energy. Our bodies and minds need to be well looked after if they are to spark in the right way. Without the right spark it is impossible to wake up regularly and to hold that consciousness. To Power Up we need to play some tunes physically – through nutrition, exercise, sleep and rest. We also need to learn how to get our minds working more productively by dealing with negativity and fear, getting more focus and being more open to possibility. And then, just as importantly, we can get enormous amounts of energy by encouraging more positive emotions and becoming more playful, more excited and more sensitized to the world in which we live and the way that we respond to it. Elements of this book will focus on how you can get your energy to work better for you and how to make sure you have enough of it. We all have different engines and each needs to be tuned and balanced in its own unique way. Experts can help us understand how to do that, but the key to success is knowing when it feels right and when it feels wrong. When you tune in to that, you can spend the rest of your time experimenting to find out what it is that helps you resonate a positive, dynamic and livened energy. Before the invention of the alarm clock, American Indians used their bladders to wake up in the morning at the right time. If they wanted to get up early they would drink plenty of water; if they wanted to get up later they drank only a little. It is a simple idea, but highly effective, and they used this method well into the twentieth century. Recently I met a man who used a similar awareness to help him make sure he had energy throughout the day and that he stayed fit. Every time nature called he would do twenty push-ups. He explained that it gave him two great benefits. First, by exercising regularly throughout his day he found he had more energy at work and therefore was always at the top of his game. Second, he never had to invest the time to visit a gym and yet he was totally ripped. The average modern Briton now spends more than twenty hours a day sitting or lying down. A recent study from the Department of Health states that only 6 percent of men and 4 percent of women manage the NHS recommendation of taking thirty minutes of moderate exercise five days a week. Take advantage of nature’s own alarm clock by doing something physical every time you need to go to the loo. You don’t have to do twenty push-ups; you could pull a plank for sixty seconds, do some sit-ups or burpees or strike a yoga pose. Choose whatever suits your body, your style and the space and facilities you have available. The key thing is to do an exercise that gives you energy, and if you make it a habit you will see the benefits it gives you. By the way, you don’t have to do the exercise in or indeed anywhere near the bathroom! After each visit, just find a space that feels good for you and do a one-minute workout. This takes a certain amount of courage if your only available space is an open-plan office, but you’d be amazed how envious your colleagues will be when you drop and give it twenty as if it’s the only right and proper thing to do. By structuring in this simple and swift bit of physical exercise you will find that your energy will be more consistent throughout the day and that you will feel more awake. Over a day this can make a huge difference to how alive you feel and to the positivity that you bring to the party. After just four days of doing this, you will already start to reap the benefits of being more buff. Buffness brings confidence and general good vibes, which is key in keeping us out of the Shadowlands of autopilot. An adapted excerpt from Wake Up! 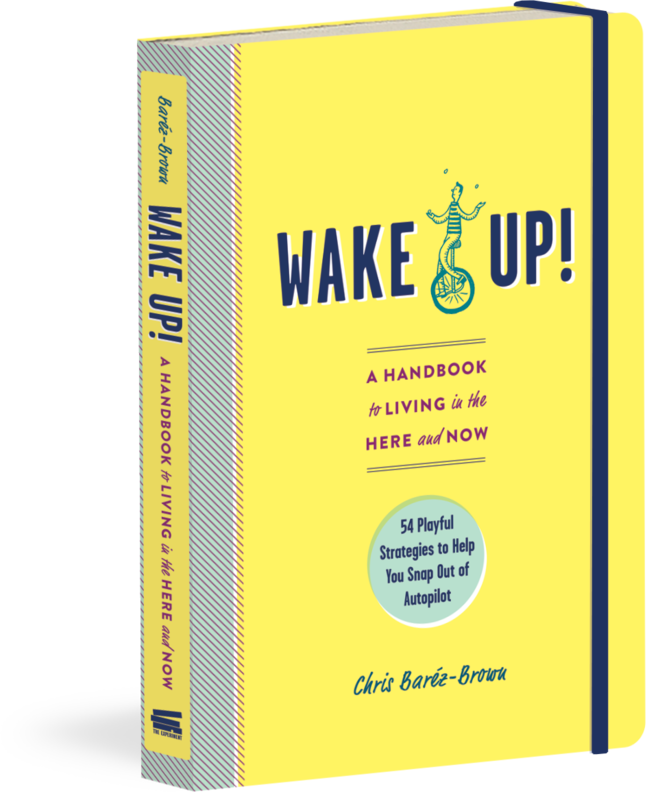 : A Handbook to Living in the Here and Now by Chris Barez-Brown. Reprinted with permission of The Experiment. Available September 19 wherever books are sold.